2004: During a late-night discussion over a kitchen table, a group of music students hatch a plan to launch a new chamber orchestra. April 2005: Aurora Orchestra stages its first concert at LSO St Luke’s, performing music by Schoenberg, Hindemith, Wagner and Debussy. 2006: Aurora launches its first self-promoted series at the Royal Academy of Music. 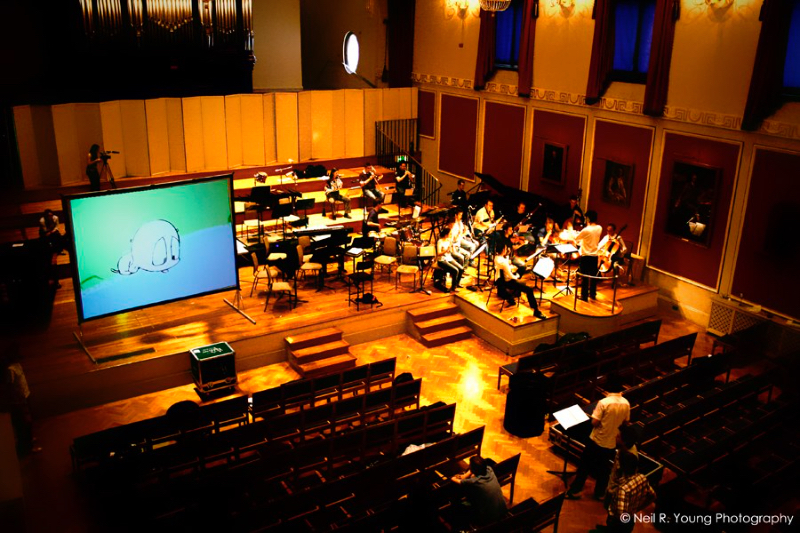 Run entirely by players, concert days involved setting chairs, buying reception drinks, printing programmes, plotting lights, welcoming guests and tracking down sheet music… 2007: A commission from the Bristol School of Animation sparks Aurora’s adventures into cross-arts collaboration. An Aurora highlight for a lucky group of principal players, this project involved staying up until 2am learning how to put up an incredibly unwieldy screen. Autumn 2009: Aurora’s fledgling office team, then one-strong in the shape of John Harte (now Chief Executive), moves into Kings Place, a brand new building in north London. 2010: Aurora launches its pioneering cross-arts concert series New Moves. 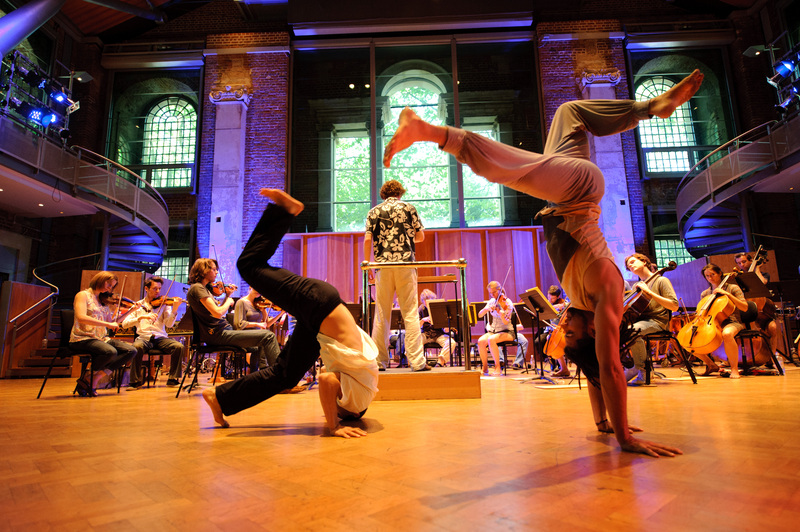 Each concert features a collaboration with an artist or ensemble from beyond the classical music sphere, with collaborators including tango dancers, Brazilian capoeiristas, painters, theatre directors, animators and klezmer musicians. The series goes on to run for six successful years. 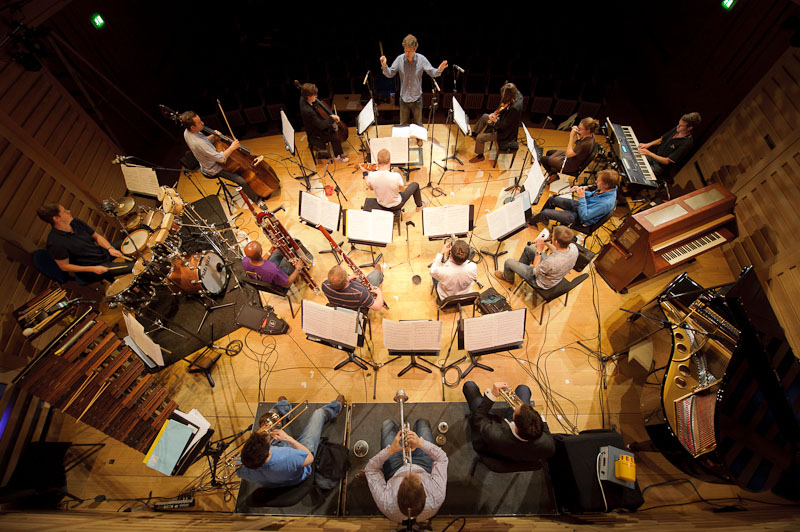 2010: Kings Place announces Aurora as its Resident Orchestra. As part of the first year of the residency, the orchestra becomes the first classical ensemble to stream a whole concert live on the Guardian’s website. May 2011: Aurora becomes the youngest-ever recipient of the Royal Philharmonic Society’s coveted Ensemble Award. July 2011: A collaboration with the production team behind CBBC’s award-winning series Horrible Histories results in Aurora’s first televised BBC Prom. The Horrible Histories Prom goes on to be one of the most-watched Proms concerts of all time. April 2012: Aurora joins Arts Council England’s National Portfolio of regularly-funded organisations. 2012: Story-telling-infused family series Far, Far Away is launched at Kings Place. Summer 2012: Plasticine legends Wallace and Gromit become the latest in a growing list of starry collaborators when the orchestra works with Aardman Animation to present the Wallace and Gromit Prom. 2013: Southbank Centre invites Aurora to play a leading role in its year-long celebration of 20th-century music The Rest is Noise, with five concerts in the Royal Festival Hall and Queen Elizabeth Hall. The project goes on to be one of the most talked-about classical music series of recent decades, with numerous programming awards. May 2013: Aurora tours for the first time to East Asia with a residency at the Shanghai Concert Hall. February 2014: A new recording relationship with Warner Classics is announced. The first disc in the series, Road Trip, goes on to win a prestigious German ECHO Klassik Award in the ‘Classics without Frontiers’ category. 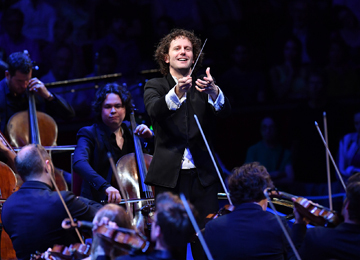 August 2014: As part of a BBC Proms performance, Aurora becomes the first professional orchestra in the modern era to perform a whole symphony entirely from memory (Mozart’s 40th). October 2014: Aurora is invited to be resident at the Melbourne Festival as headline classical act. 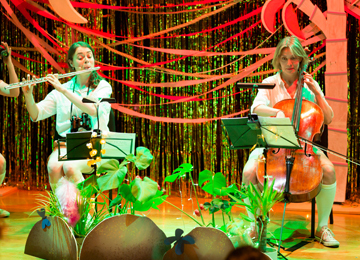 June 2015: In partnership with the Royal College of Music, Royal Albert Hall and Tri-Borough Music Hub, Aurora stages Seven Seeds, a new oratorio created by composer and John Barber and librettist Hazel Gould in collaboration with hundreds of school children from across three west London boroughs. The project goes on to win an RPS Award and a Music Teacher Award. 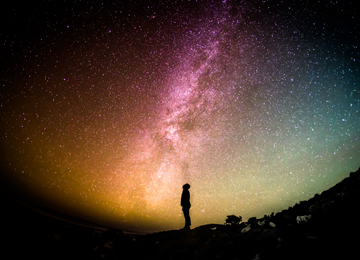 January 2016: Aurora launches a new five-year series at Kings Place built around the first complete cycle of Mozart’s piano concertos ever to be staged by an orchestra in the UK. February 2016: Southbank Centre announces Aurora as its newest Associate Orchestra with the launch of The Orchestral Theatre, an experimental concert series named in memory of Sir Claus Moser. 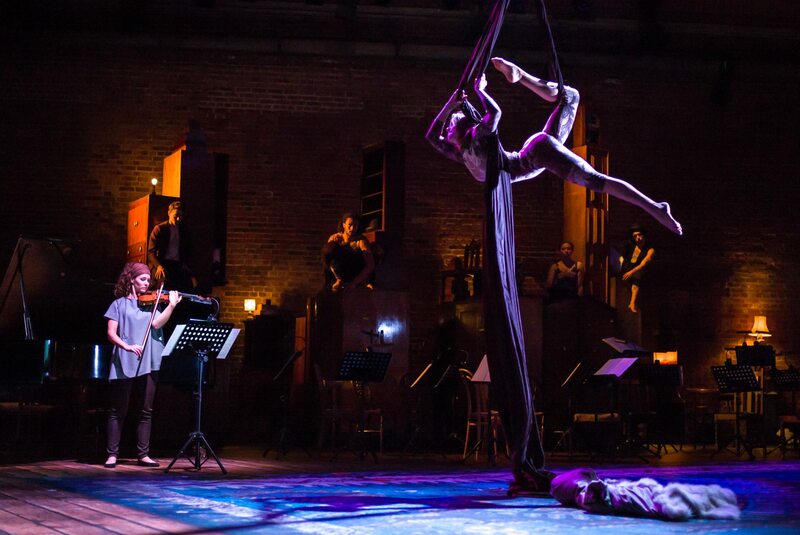 June 2016: Aurora opens the 2016 Aldeburgh Festival with Illuminations, a collaboration with Struan Leslie bringing circus performance with music by Britten, Debussy and John Adams. 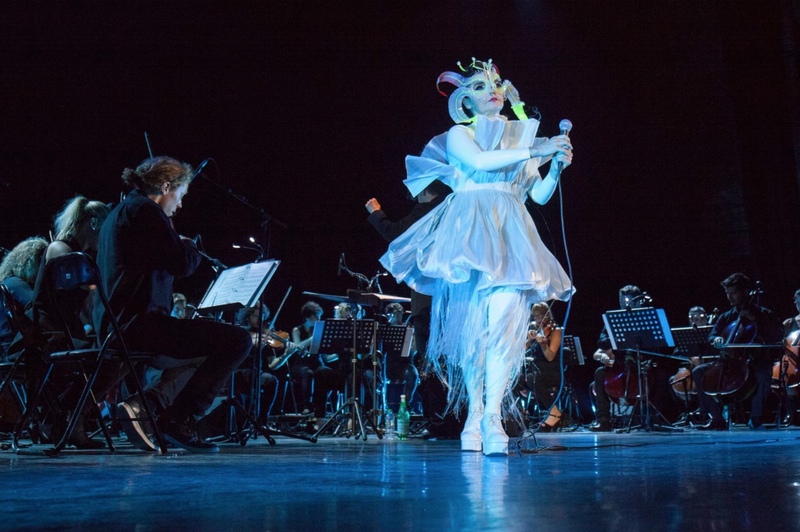 September 2016: Björk invites Aurora to perform with her for two sold-out London shows at the Royal Albert Hall and Eventim Apollo. December 2016: Now with a full-time office team of six and an ever-expanding national and international touring programme, Aurora launches a new website and one of its richest concert seasons to date. And there’s much more to come…!